For musicians in life, making sound is the sole point of existence, but one of the biggest issues around this is the fact that if someone has to practice in their home – everyone else has to be a part of it too. 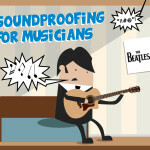 Having to lug instruments and equipment to practice rooms and recording studios may seem like the only option, but there is an alternative; soundproofing a room or practice space in your home. Although this may sound like an expensive solution, thousands of artists all over the UK have turned their spare bedrooms into a practice space or recording studio, where they can play without disturbing anyone else. 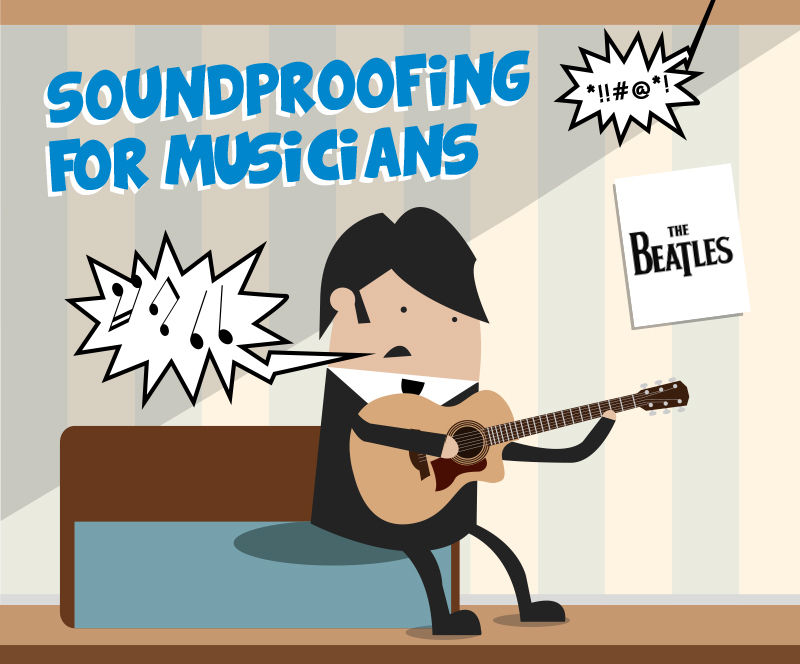 Getting the door soundproofed correctly is imperative to the sonic qualities of the room as a whole, as it is always regarded as one of the main sources of sound loss. This problem is mostly due to the gaps that are found between the door and doorframe, but the door itself is a good starting point. “Effective acoustic seals around the frame and thresholds are of course essential, but the main item that will be blocking the noise is the door leaf itself. To ensure a sound-tight seal, you can purchase expanding foam seal tape online for expense very reasonable price. You will need to apply this to the frame and do so when the door closes. This improves sound insulation approximately 65%. Although doors can present a significant challenge when it comes to sound leakage, if your windows are not double glazed, there is a very high chance that these will be the biggest cause of your problems. Of course, even double glazed windows do allow some sound to escape and are far worse at insulating than any of the walls. 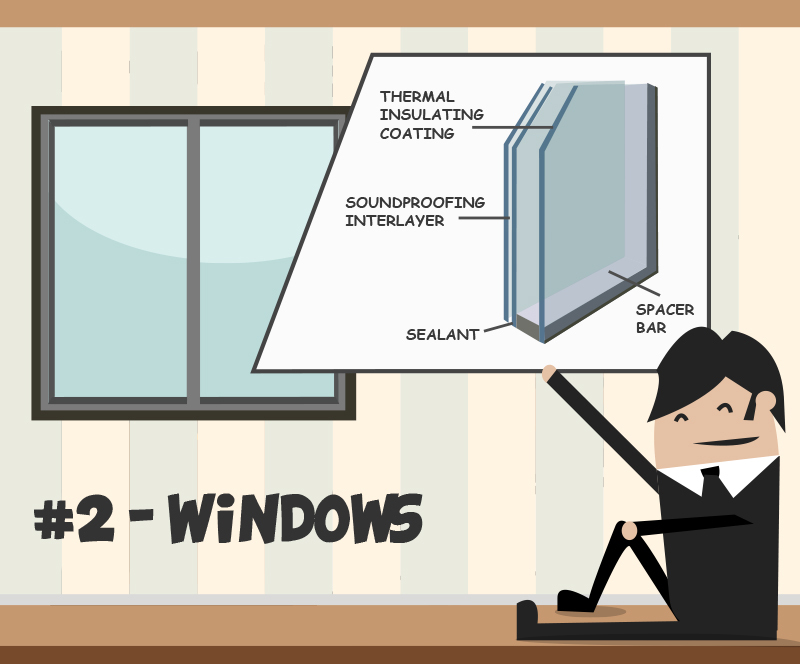 In either case, DIY secondary double-glazing kits are quite cheap to buy and are also simple to install,as this video shows. If you really want to avoid sound leakage however, an alternative solution to the above is to block out the window altogether using a heavy wood or MDF shutter. This is the approach taken by many professional studio converters. If this is too much of an expense, you can also use sandbags, though they aren’t very aesthetically pleasing. There have been stories of people gluing egg cartons to their walls, with the assumption that this will help reduce the noise, but unfortunately, the only thing that this will do is make your walls look silly. If you plan to improve the sonic insulation properties of an existing wall, there are a number of ways to do this. The first is to create a totally new wall in front of the existing wall, as long as you don’t mind losing a little space along the way. By adding a sound-deadening board and an extra drywall to each wall of your room, you could look to reduce noise leakage dramatically. This method, although it may take a day or two, is relatively inexpensive though you will lose an inch or two of space on each of your walls. Another solution is to use something called Green Glue, which is a compound that converts sound energy into heat. This can also be sandwiched between two surfaces such as dry walls. Remember however, that Green Glue takes around ten days to set and another 20 before it reaches its maximum efficiency. 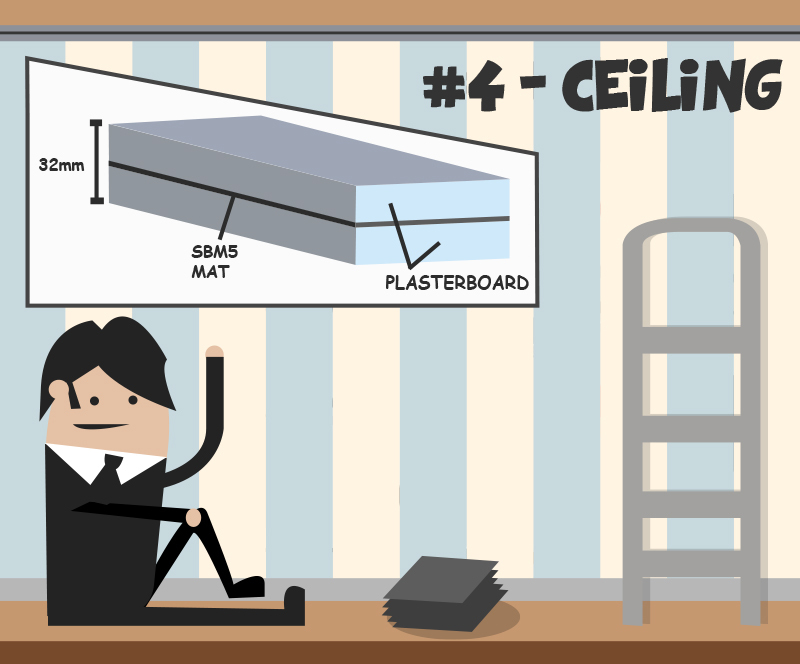 When it comes to the ceiling, acoustic foam tiles do look attractive, but the truth is that they will keep out very little sound. If a professional were to look at the situation, they may suggest a false ceiling to add insulation, but this simply is not practical when it comes to the home. One solution is to look at the floor above (if there is one), and asses the gaps between the floorboards. From here you can fill them out relatively easy with mastic, though you also may want to consider fitting barrier mats (otherwise known as SBM5) between the joists. Remember however, to fit the barrier mats first so you can then fill the gaps with insulation-grade Rockwool. Soundproofing the floor works a little like soundproofing the ceiling, except this time, you have gravity working in your favour. 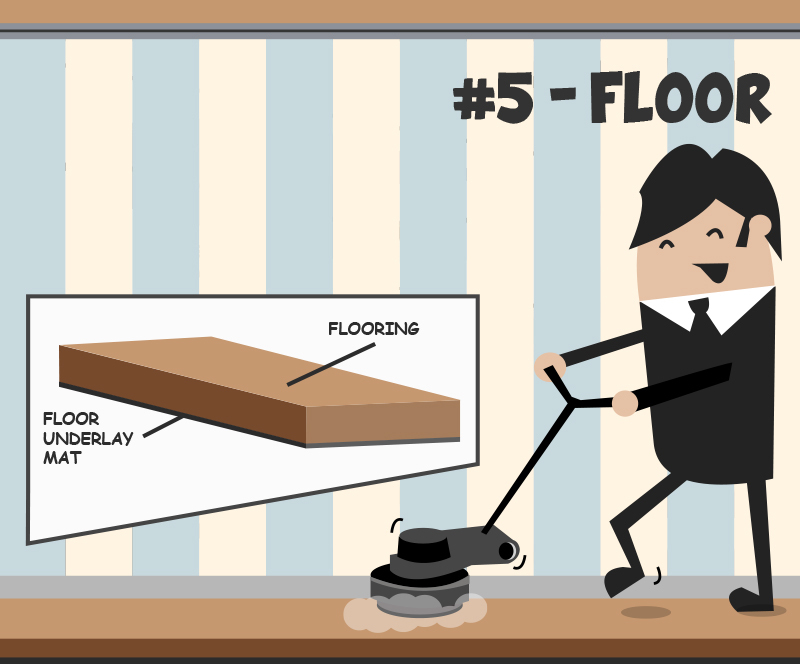 On the other hand, it does really depend on what kind of floor you have to work with (concrete being the best). Sonically, domestic floors are typically very poor at providing insulation, so with this being the likely case (if you’re not working in a garage), you may have some work ahead of you. The cheapest option is to fit a thick underlay beneath your carpet, which can be bought in rolls for around £30 – £50. If you are looking to buy a new door for your home, it is very important that you do not measure the existing door, but on the actual door frame itself. Here are a couple of tips to help you measure an existing door frame. To measure the width, take three measurements inside the door frame. Do this at the top, middle and bottom, using the widest measurement to determine the width of the door. Measure the inside of each vertical side of the frame. Again, the longest length determines the height required. Before fitting the door, remember to make allowances for any carpets that you may have. Now that you have gathered your measurements, compare them with the standard sizes available with your chosen door. Remember that the measurements may not be exact, but the option to plane the edges of the door is always there if you need to make room. 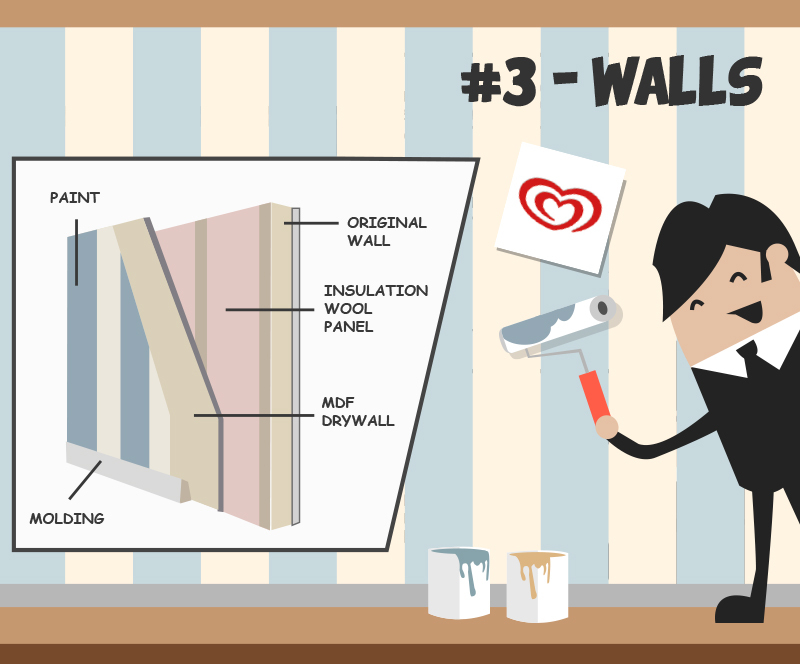 If you need help with fitting a door and painting it then check out our other handy guides. There’s always that problem of not quite knowing what to do when you’ve finished painting, particularly with latex. What should I do with my brush? Put it in the sink? Let it dry? Or simply be lazy and throw it in the bin and buy another next time? Most people go with the latter, and they needn’t. Latex paint is relatively straight forward to clean-up and will save you having to run out to the shops for a new roller or brush every time you need to do a paint job. Although you can make it a lot more difficult for yourself. The golden rule of cleaning latex paint is don’t let it dry. Despite being a water soluble paint, it is notoriously difficult to clean up once dry. An acetone based product, available from most DIY stores will help, but save yourself some strenuous scrubbing and start your latex paint clean-up process immediately. With latex paint being fine to go down the sink, you can run your brushes and equipment under the tap. It is important however to remove as much paint as possible from your equipment before you being to clean-up. Using a paint solvent to enhance the cleaning, you can work the substance into the bristles of your brush and repeat until the paint has disappeared. Of course some people don’t wish to run paint under their sink, particularly in the kitchen. Outdoor cleaning is fine and probably saves you from flicking paint across your worktops. Making sure you find a suitable spot to tidy, away from any edible plants and plenty of distance from a natural water source, you can simply repeat the process mentioned previously and leave your equipment to dry out in the sunshine. However, if you’re anything like me, then the clean-up process doesn’t end there. Not only will there be paint drops speckled all over the face and work clothes, but on the carpets and windows as well. But panic over, there’s a technique to remove all latex paint stains, and it’s pretty simple too. Surfaces such as glass and tile can be gently scraped off with a razor blade or sharp object, whilst removing the stain from a carpet takes a few more steps. It’s important to treat a stain as soon as possible if you splash any on the carpet. After scraping or sponging down the spill, dry-cleaning products will help remove any marks and cover with an absorbent pad dampened with a dry spotter. As the pad picks up stains, keep changing it and keep it moist with the dry spotter. If any stain remains, add some dry-cleaning fluent to the material to loosen the stain, and repeat the process. And voila, your partner will be none the wiser. Once you have your new door ready to hang and painted beautifully, there is only one thing left to do – attach a handle. It may sound like quite a daunting task, but once you know how to do it, you will be changing all your door handles with the greatest of ease. Wedge your door so that it is straight and allows you access to every side of it. Mark where on the thin side of the door you want your latch to be (usually approximately one metre from the bottom of the door) and drill a hole the depth of the latch. Insert the latch into the hole you have made and place the latch plate over the top so that it lines up. Draw around the edge of the plate using a pencil and remove the wood inside the area with a chisel and hammer to create a recess the same depth of the plate. Create a hole with your drill all the way through the width of the door where you want the handles to go. Reposition the latch plate and mark where the screws will need to go. Insert the latch and screw the latch plate into place. Insert your door knobs into either side of the door so that they are lined up with the locking mechanism and the screw holes. Hold the handle in place with one hand and drill the screws in with your spare hand. Position the latch where the door closes and locks onto the door frame, before drawing around the striker plate with a pencil on the door frame. Remove the wood with a chisel and hammer to create a recess the depth of the striker plate. Drill a hole into the middle where the latch will go. Screw the striker plate into place and check the door works properly. 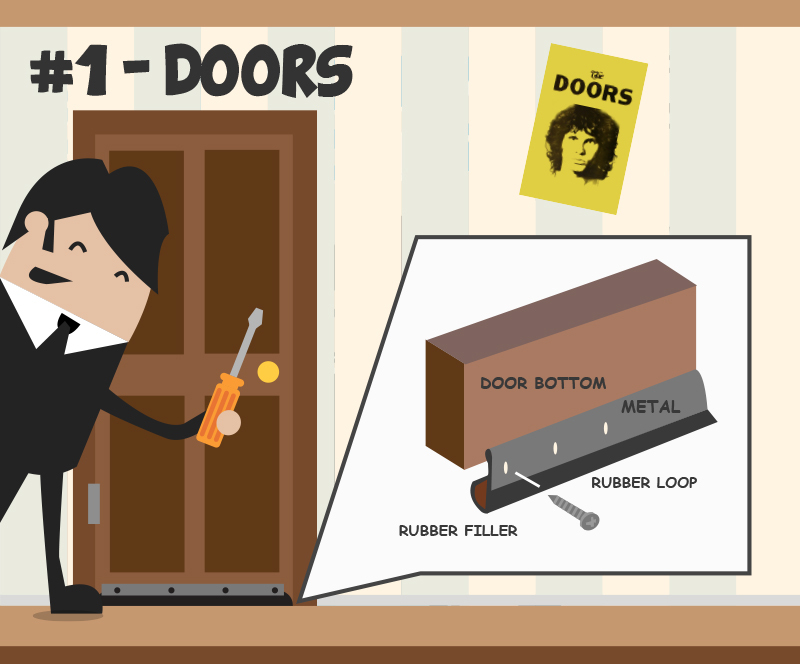 The first thing you need to do is fill in any cracks and holes that may exist in the wood of your door. Use a putty knife and wood filler to even out the surface so it is ready to be primed and painted. Using an electric sander or just a piece of strong sandpaper, remove any rough edges or old paint so that the surface of the door is smooth and ready for the next step. Wipe away any resulting dust and debris with a damp cloth. Work across the whole door using paintbrush number one and a layer of wood primer. Cover all the bare wood with the primer and make sure to use a thin layer so that it doesn’t drip down. Once the primer has completely dried, use your second paintbrush to apply two coats of your chosen paint. Pour a small amount of paint into a container to make it easier. Brush the paint along the grain of the wood, starting with the panels and working outwards. When the coat has completely dried, give the door a final topcoat of paint and wait until it has completely dried. Once you are happy with the colour of your door you can replace any fixings and hang it.